You are sick to death of hearing about my love affair with the iPOD – but has it made you go get one yet? I just wanted to end this string of posts about iPODS and ways that you don’t have to be anti-social to have and to USE them and a few inexpensive things you can get to really make it part of your life as opposed to something you plug into your ears and block out the rest of the world. Thought it would make sense to have these thoughts reasonably close together, so you can easily find them. So, here is a quick post about an iPOD adapter that you can plug into your car and play through your car speakers. Actually this particular one that I have is made by BELKIN, (from Best Buy of course), picks an unidentified radio signal, you tune your tuner to that station and your iPOD actually goes through that frequency while the sound comes out of your speakers as if it were on the radio. PLUS this one I use charges your iPOD at the same time. Remember the days of the portable CD player that had a little fake tape that you put in your cassette player in your car? If you still have a cassette player in your car and have been wondering what to do with that “dummy tape”, just plug the fake cassette into the player, then the little gizmo that you used to plug into the CD player, plug that end into the headphone jack of your iPOD. It doesn’t charge the iPOD, but it plays great just the same. So enough about iPODS, atleast for a while, I promise!! I know, I know you just think these things are gadgets that encourage anti-social behavior in public places and I cannot say that I blame you. When your kids “tune you out”, when that hot guy at the gym “tunes you out,” you look at them head on and they all have earphones in their ears and they are paying attention to IT and NOTHING else that is going on in the real world. NOTHING! So you hate iPODS. It is a myth that you have to be anti-social to really USE an iPOD. I had a recent post about why I like them and how the average 40+ “Jane” or “Joe” can make real use of them. For stuff REAL people like us- like, you know, learning a language, listening to that book in the car you never had time to read. Click here to check that one out. There are several things – none of them very expensive that can help you remove the anti-social piece from iPODS I promise it can work for you and easily! SPEAKERS! Now here is a way to use your iPOD like a stereo. Remember it is better than carrying that stupid boom box that you finally embraced after the “Let’s Get Physical” era! Or those books of CD’s and you never have the one you really want to listen to! Just like me, you are probably not an isolationist. You want to play your music or books so everyone can hear it. Or so you can cook dinner and listen without headphones on. There is also have a way to plug it into your iPOD into your car speakers and everyone in your car can hear it. I went to Best Buy yesterday and found these speakers with the help of some very nice people there. I really like a “techie-type” store where I enter the place and there is somebody as old or OLDER than I am as a greeter. Then when I get to the area someone that actually cares about what I am looking for and doesn’t try to sell me something I am not looking for and don’t need. 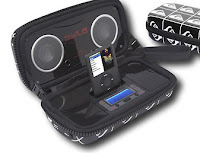 Portability, easy to carry and safe to travel – doesn’t break!! I had all ready learned that having battery capability was important. You go on a picnic, you end up being in some camp with no power or there is no plug where you want the music to be. So flexibility was important. If I can only use something “sometimes” I won’t use it. I get out of practice and it lands on a shelf some place and I have forgotten about it. My pick for speakers is the Sonic Impact. (as pictured above) It is perfect and you need to get one. You can tuck it away, take it to camp and share your music or take it on a picnic. The hardest thing about it is you need to keep it from your kids! They will take it to the beach and fill it with sand. Like you, I have many people in my life that love to send me photos. These photos come in all sizes, shapes and of course quality. But when was the last time someone sent you a snapshot that WASN’T a Christmas Card? I remember my mom’s Kodak Extralite 110 Camera. When the flash was turned on, you could hear the sound of it coming up to speed. I think there were more pictures taken of us swimming and at camp on this camera with a finger in the viewfinder that anyone wants to count! Lots of photos that came back from the developer that had to be thown out. There are digital cameras, tons and tons and I am not going to discuss all the types of them out there, there are plenty of websites and information for that. What I want to talk about is the photos themselves. These are memories and worth much more than the money is costs to protect them. If you have a fire, flood or ex-spouse in your life you come to realize how important they can be. How you store them, how you share them and how you print them, needs to be easy, reliable and safe. If you don’t have consistency in photo sharing and storage or don’t like how anyone else that you know works, then here are some questions you may want to ask yourself before you look at other options. How many photos do I want to save in one place? How long do I want them to be saved there? How much memory do I have in my computer? Do I consistently “back-up” my computer or will I save them on CD’s? Do I want to use this photo storage area to generate gifts – calendars, mugs, t-shirts to send to my friends? Keep in mind, some services are free, some services have a fee and some are both. Some services allow you to save so many (depends on space) and then charge you a fee when you exceed the free space limit. Sending a bunch of photos via email is easy but tricky, since most photos are quite large as well as sometimes these messages get refused all together or sent to a SPAM file. If you have a friend, a child or somebody in your life that uses a certain service, likes it and can help you learn how to use it, then it may not be a bad idea to use the same one they do, you can be part of the same network and you can help each other use all the whiz bang features that are part of the service. Online Photo Services can be presented a few different ways. First way, (I would never recommend this one) is a software program to add on to your computer, I don’t recommend it because it means all your memories are trapped in a box that can be struck by lightning, flooded in your basement, invaded by a virus or just slow down everything else you are trying to do on your computer. Your computer has to churn through these photos plugging up your drive. NOT to mention if this is your WORK computer and not your own computer! If you still want to store them locally, save them off to a hard drive – this is the one I use it is from Best Buy and it hold 500GB!! Photos are big and for $99 bucks it is worth it. You can keep them in one place, but it really isnt perfect for sharing them the way photo services are. Second way: Is the external software service – or some call it “web-based” and all of them I know of allow for storage, sorting by multiple albums, searchable key words and the ability to invite people to view or to keep your photos private. You can access your photos with your user name and password from anywhere you have internet access. It does not have to be on your OWN computer. Other photos sharing services people use that I see are: Flickr which alot of my geek friends use, but have no fear it is also very easy to use! Shutterfly was a service I used for Christmas Cards last year, because a friend of mine told me about where he had his made and I was very happy with how they turned out- only to realize that webshots has the same service!! My brother and sister-in-law as well as a bunch of friends have Kodak Easy Share Cameras and they swear by the Easy Share Service. I have a home HP photo printer and I must say I find it a pain. More cartridges, more types of paper, now that I have it, I use it. The paper and ink is expensive. I know lots of folks that just save their photos to a memory stick or set up a Walmart or Sams account email the photos and go to the place and pick them up all ready to go. These are secure websites and the quality of the photos I have seen are as good as the ones I have printed at home. Remember that all these things change and get easier to use, but also don’t let your years worth of photos pile up on a big memory card and find out your new puppy has chewed it up or it is corrupted somehow. Memories are precious, if you took the time to take the photos, find an easy way to keep them! *Thank you Best Buy for the MyBook photo and to this website Dial 11o cameras for the kodak photo.